Along the main trail on the Morton Arboretum’s East Side, near the end of a long clearing, sit four large white columns. There are no signs indicating what they are nor what they mean. Simply four large white columns. 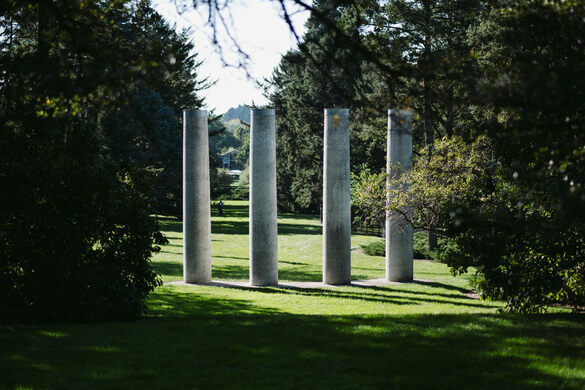 According to the Arboretum, the columns were built in 1960 when the founder’s granddaughter, Suzette Morton Davidson, requested that her father hire an architect to re-create four columns that had been in her downtown Chicago apartment. The columns were each built 19 feet high and made with dolomite taken from northern Michigan. Davidson later “invented” a meaning for the columns, stating they represented her grandfather and his brothers. However the arboretum’s website also strongly suggests that one should create their own meaning.